The first manned flight of the Apollo CSM, the Apollo C category mission, was planned for the last quarter of 1966. Numerous problems with the Apollo Block I spacecraft resulted in a flight delay to February 1967. The crew of Virgil I. Grissom, Edward H. White II, and Roger B. Chaffee, was killed in a fire while testing their capsule on the pad on 27 January 1967, still weeks away from launch. The designation AS-204 was used by NASA for the flight at the time; the designation Apollo 1 was applied retroactively at the request of Grissom’s widow. Chaffee graduated High School from Central High in Grand Rapids, Michigan in 1953. He attended Purdue University and received a BS in aeronautical engineering in 1957. In January, 1963, he entered the Air Force Institute of Technology to work on an MS in engineering. A Navy ROTC student, Chaffee went on active duty in 1957 and after training in Florida and Texas became a pilot. In March 1960, he was assigned to the Heavy Photographic Squadron 62 at the Naval Air Station in Jacksonville, Florida, and flew photo-reconaissance missions over Cuba. 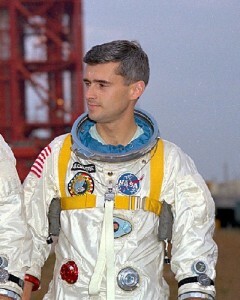 Chaffee was one of the 14 astronauts selected in October 1963. After completing basic astronaut training, he worked on deep space communications and the Apollo spacecraft development. 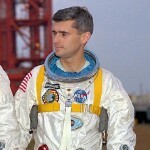 He was named to the Apollo 1 crew in March 1966. Lieutenant Commander Roger Bruce Chaffee was killed in a flash fire aboard the Apollo 1 spacecraft on January 27, 1967 at Kennedy Space Center Launch Complex 34. Chaffee, Virgial “Gus” Grissom and Edward White were training for a planned 16-day Apollo mission scheduled for launch on February 14, 1967. It would have been his first spaceflight. At the time of his death, Chaffee had logged approximately 2300 hours of flying time, 2000 of those hours in jets.